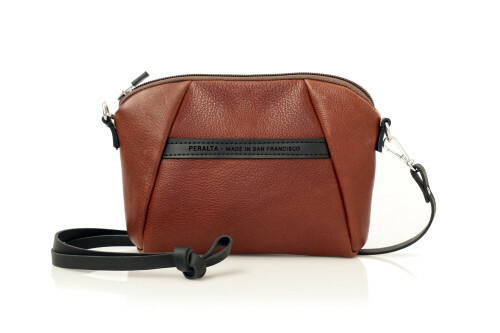 Peralta is a line of bags developed by WaterField Designs, a San Francisco design company. This design company has a number of products for tech-savvy customers such as the Staad Backpack and Bolt Briefcase. The Peralta line was created for professional women “juggling life’s many responsibilities.” I had the pleasure to review the Abby iPhone Case for the iPhone 6s, 6s Plus, Samsung Galaxy and other phones of similar or larger sizes. As advertised it is an all in one elegant phone case and stylish purse. The 8.5 inch long by 6 inch tall by 1 inch wide, Abby iPhone Case weighs only 6.4 ounces and is designed for carrying essentials. I was able to carry my iPhone 6 Plus, a slim card holder, checkbook, lipstick, and travel size tube of hand lotion. The materials used are from Luna Textiles, a woman and minority-owned San Francisco company known for their unique upholstery fabrics which include Nano-Tex treatment used to resist spills. In addition, the whole hide leather is pebbled giving it a texture that will show fewer scratches and rain spots. You can choose between the black or mahogany colored pebbled leather or two water repellent graphic designs by Luna, blue/gold or red gala. The Abby iPhone Case has an ultra suede iPhone pocket, a removable leather shoulder strap and self-locking YKK, a premium zipper known for its durability. Other quality features include finished seams, a feature that prevents unraveling, interior gold lining for visibility, and leather accents. As advertised, I was able to use earbuds to handsfree talk while my iPhone was stored in the purse. 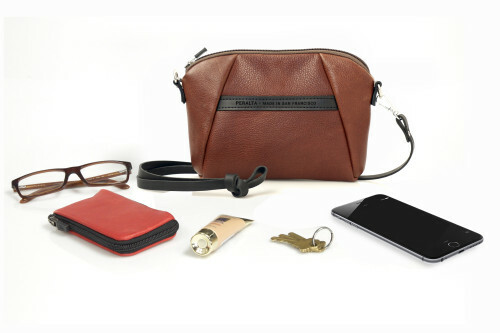 The small Abby iPhone Case can be stored in larger bags or backpacks. 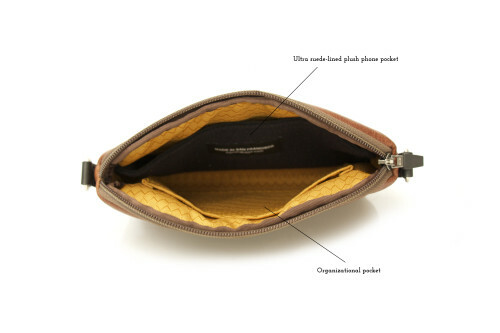 It can also be carried as a stylish clutch by removing the leather strap. I was thoroughly pleased with the Abby iPhone Case. The style and quality construction of this small purse led to a number of compliments from my female colleagues. I hope to review other products from Peralta line. It is obvious that they consulted working women when they designed this bag. It satisfied every requirement I have for a phone bag.